Module 1: Who do you think you are? Each of us is made up of many different “selves” or parts. In this first module we will focus on the more dominant parts of your personality, and discover an amazing system of selves that protects you and keeps you safe in the world. 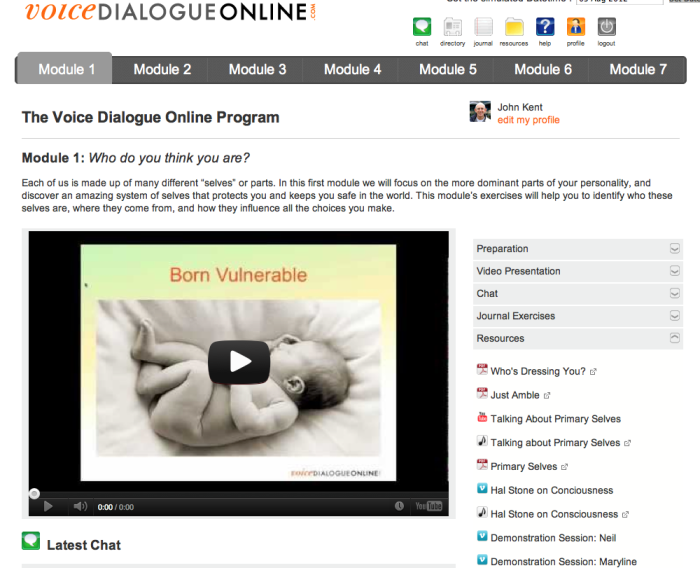 This module’s exercises will help you to identify who these selves are, where they come from, and how they influence all the choices you make. For every dominant self that you identify with there is another that gets hidden away in the shadows. In this module we will invite some of your buried selves to step into the light. The exercises will enable you to make friends safely with the “darker sides” of your personality and appreciate the gifts they bring. More importantly, you will discover the purpose that each of them has and how these selves can enhance your life and bring you new and creative ways to deal with life’s challenges. Module 3: Inner Critic - friend or foe? Although it doesn’t feel like it, the inner voice that’s constantly criticizing you and telling you what you should look like, how you should behave, and what you should think and say, is actually trying to protect you. Your Inner Critic simply wants you to follow the rules laid down by your family, society and culture. Befriending your Inner Critic will help you to distinguish between the rules that have been imposed on you from the outside and those that are meaningful to you personally. How would it feel to stand between your many selves and to take control of them instead of having them take control of you? In this module we will explore ‘The Choice Point’, a place in the middle where you get to embrace your opposing selves and to listen objectively to their conflicting voices. Using the exercises, you will discover a place of balance and authority where you get to appreciate all of your selves and make more considered choices in all areas of life. Module 5 redefines relationship as teacher, healer and guide. We will explore the dynamics of relationship in order to help you to understand the roots of conflict, why you attract the people you do, and how to break recurring patterns of behaviour. You will discover how to create loving ‘no fault’ relationships in which you can communicate your needs, hopes and fears in a more open and honest way. Your unconscious is relentless in its wish for you to be emotionally and physically in balance. In this module we will explore the different ways it ‘knocks on your door’. Working with dreams, fantasies and physical sensations including aches, pains and fatigue you will find out how to access and interpret the messages your unconscious sends. In module 7 we’ll take a look at ‘Team You’. You will create an action plan that will enable you to harness the talents of your many and diverse selves. You will learn how to strengthen the Choice Point so that you become the inner CEO of your own formidable team. - Live a richer, more fulfilled life! In addition to the 7 module program, choosing this option will entitle you to a one hour private consultation via skype with one of the Program facilitators. You will have the chance to meet some of your selves during the 1-2-1 facilitation, and ask questions on any aspect of Voice Dialogue. The facilitators have studied with Drs Hal and Sidra Stone and are very experienced in running Voice Dialogue workshops as well as conducting private sessions face to face or via the internet. They have worked extensively around the world with small and large groups, individuals and couples. Once you have registered you will have unlimited access to the e-learning site for six months. Each of the 7 modules has its own page where you can view the presentation and other video material, complete the online exercises, and download the articles and mp3’s.